Shovel & Fork is teaching a class on container gardening on June 14, 2014. The class will be taking place at the Bissell Centre, and proceeds collected will go towards helping the Centre establish their own rooftop garden. Tickets are $70. A reminder about Hawkers Market on June 14, 2014 from 6-11:30pm at the Mercer Warehouse. Dishcrawl is back! 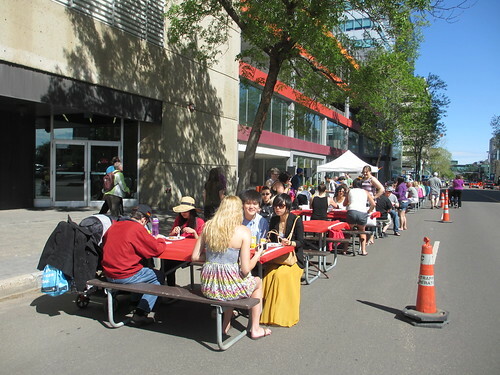 Their first event after the hiatus is taking place on 124 Street on July 15, 2014. Tickets are $60 and will grant you three meals at three restaurants. Congrats to Confetti Sweets whose storefront in Sherwood Park is now open. Looking for Sailin’ On’s massively addictive coconut bacon? It’s now stocked at the Italian Centre! It’s finally official: Earth’s General Store is moving to 104 Street, taking over the storefront formerly occupied by Pangea. I was surprised to hear about Chef Nathin Bye’s move to Murietta’s. I wish him all the best in his new endeavours! Phil’s latest Burger Odyssey post pits Delux against Local. Who comes out on top? Vue Weekly offers some background on the concept of Bar Bricco. The Journal had a great piece on Edmonton ex-pat Leanne Brown’s Good and Cheap cookbook, which helps people maximize their food dollar. Chef, a fictional film about the rise of a food truck, opened last week to positive reviews. I hope to check it out soon! Say it ain’t so: Top Chef Canada has been cancelled after four seasons. I know there will be other TV outlets for Canadian chefs to be highlighted (Chopped, Masterchef), but I think Top Chef had a tangible impact on raising the profile of the young talent who participated, and allowed Canadians to look inward, instead of only ever appreciating chefs south of the border. I’ve now stepped down from the board of the Downtown Edmonton Community League, but it was nice to finish off my term with the annual pancake breakfast. It was a little chilly, yes, but the sun made it a pleasant morning. Thanks to those who came out! 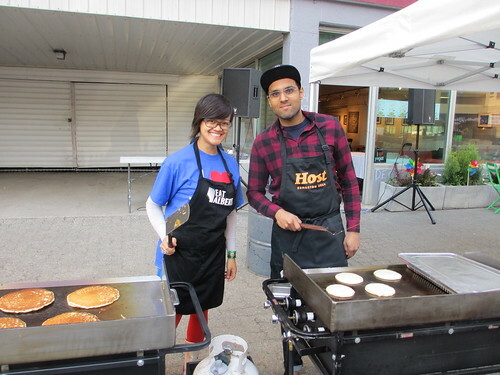 Sarah and Milap were pancake flipping pros! 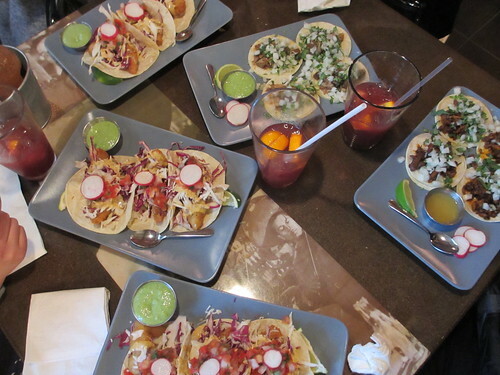 All my Mum wanted for her birthday was tacos from Tres Carnales – we made sure she also had a side of celebratory sangria. Delicious!